Vivo introduced his Apex full screen display concept with 98% screen-to-body ratio and an in display fingerprint scanner at the MWC in February last year. Today the company posted a teaser for launching Vivo APEX 2019 bezel-less smartphone. The Vivo APEX 2019 expected to announced on January 24 in China. The company later launched its Vivo NEX and most recently Vivo NEX Dual experimental smartphones. Vivo company is getting ready to announce a new smartphone in China later this month with the name of Vivo Apex 2019. As per the leaked revealed that Vivo will use liquid metal in the construction of the phone. 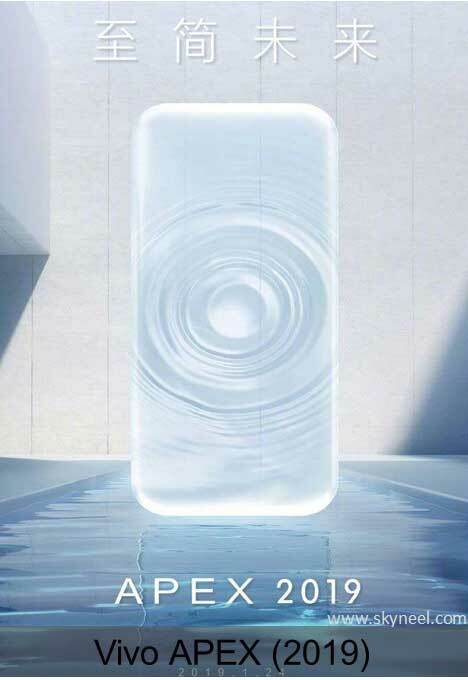 According to the latest report the Vivo Apex 2019 smartphone codenamed “The Waterdrop” revealed a curved design without any notches, bezels, or physical buttons. This shows a more curved design without the front camera or even the buttons on the sides. This smartphone comes with pressure sensitive and gesture based navigation. It is assumed this phone comes with gesture navigation and pressure-based integration feature. You can also get large and improved in-display fingerprint scanner feature, just like OPPO and Xiaomi. As per the leaked renders this phone show a device with no bezels and buttons on the sides. The Vivo APEX 2019 may have feature of half-screen in-display fingerprint sensor and don’t have any physical buttons or ports feature . The Vivo APEX 2019 smartphone could comes with 8GB RAM powered by Snapdragon 845. As per leaked report company also ready to announced in two variants – 10GB or 12GB RAM. The Company has not yet confirmed this, we are expecting the company showcase this phone. It is assumed to showcase in upcoming Mobile World Congress 2019 in Barcelona, Spain which will kick-off on 25th February.